My Rental Ads is a certain area where real estate agencies and private persons can manage information on the rentals they are looking for or provide. All apartment rentals search listings added by certain member are located in this area. Member can add new ads, change existing one, and even change profile status to agency or private person. Submitted ads won’t be removed when member changes his site status. It is urgent to specify if you are adding the listing as a private person or as an agency. Registration status can be changed easily on this page. “Change your registration status” link tracks to member profile page where one can specify is he’s a private person or add information about real estate company he presents. “Add your advertisement” listing can be used to add new rental offer or rental search listing. First part of listing registration contains the most common information. Private persons should specify if they look for or provide rentals. Apartment location such as country, region and city can be selected here. “About apartment” area allows to specify more information about apartments. In the Rentals description area a property owner can indicate requirements about monthly and advance payments (payments for those who’s going to rent the dwelling alone provider can indicate different prices) for rentals. Owner may specify accommodation type, conveniences included, furniture, surroundings, number of rooms, square (in m), floor, maximal distance to subway, and lease period. Owner can specify available date here if offered rentals are not available at the moment. Those who are looking for rentals can indicate their move date here, min and max monthly payments, accommodation type, conveniences, and furniture included, surroundings, number of rooms, and approximate lease period. Property owners can submit rentals plan into the listing using “Plan” option. Photo size should suit site limitations indicated. “References” and “About me” Areas contain personal description of rentals owner. “References” Area is formed by rentals owner and contains requirements to desired apartment owner. “About me” Area is completed by those who are looking for rentals. Both rentals provider and a person who’s looking for rentals can also add their photos into profile. Maximum number of uploaded photos and their size limitations are managed by site administrator. Additional rental information or requirements can be added in the “Comments” Form. Note 1: Information about desired or offered rentals will be available on the site only if author made it active. Every ad status is shown on the rentals description page. “Make available for search” link can be used to make listing available for all site search options. “Prolong in search” option allows to disable listing on the site, but keep it save and available for future use. 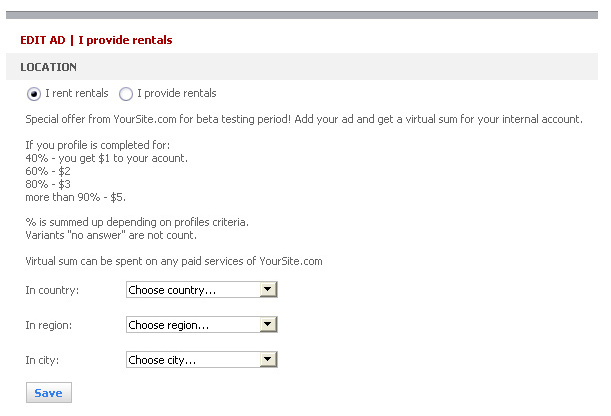 Note 2: Once rentals profile is submitted for more than 40% special site bonuses can be used. For more information please see “Account” Area. Note 3: Real Estate agencies can add their listings manually submitting all required forms and can also submit all listings at once. To use this option member should change his status as an agency, and use “Operations with database”.